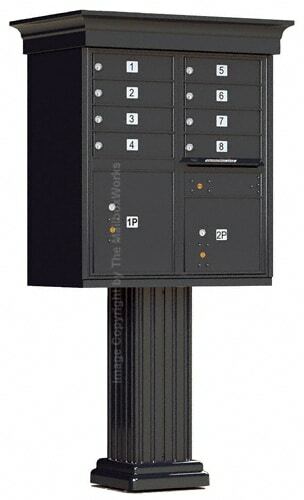 Designed as 13 door CBU mailboxes column mount, these ready-to-install decorative stucco columns conveniently upgrade commonplace Commercial Mailboxes into customized neighborhood centralized mail delivery centers. To install, simply slip the stucco column over any Florence 13 Door CBU cluster mailbox and pedestal unit for a custom high end mail center appearance. 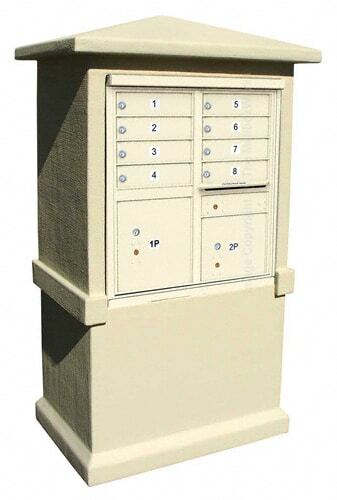 The foam core interior of the stucco column is designed to crumble upon high impact and is safer than old-style cinder block and steel stud mailbox columns. Stucco finish holds up well in all types of weather and can be repaired and repainted if needed. The exterior-grade stucco surface looks great even after years of use. 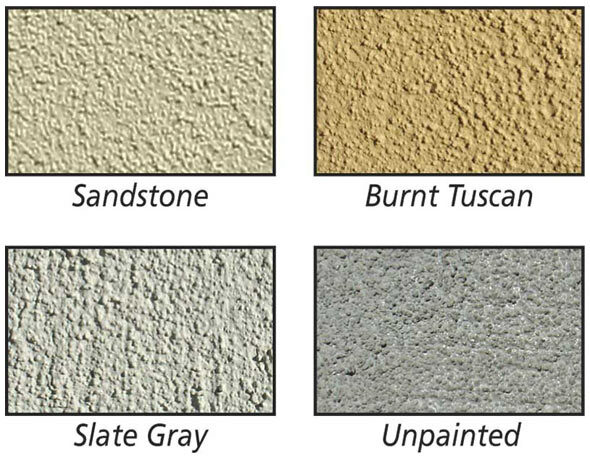 Select from Sandstone, Burnt Tuscan or Slate Gray paint finish or order an unpainted mailbox stucco column and add your own paint finish. 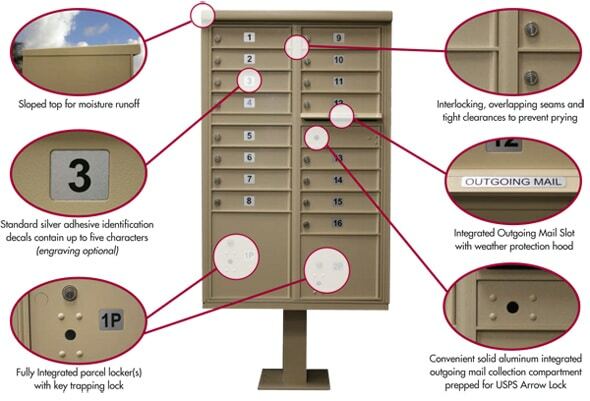 Rust proof powder coat finish on Auth Florence CBU mailboxes resists damage from force and harsh weather. 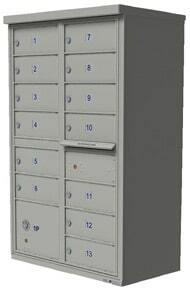 Choose from stock silver placards as shown, or have tenant door mailbox numbers engraved. 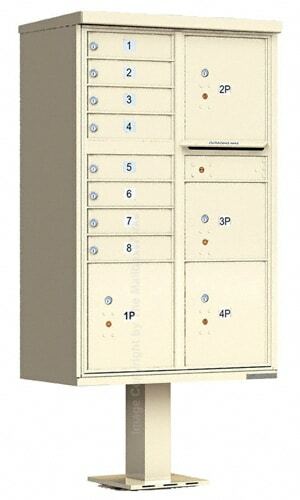 Auth Florence 13 Door CBU mailboxes column mount are one of the safest available centralized mail delivery centers and available with parcel lockers. 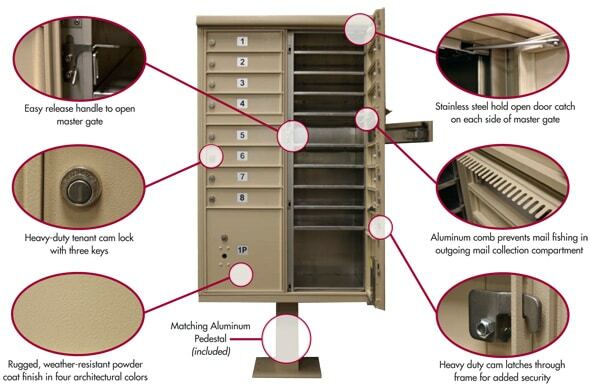 Security features include interlocking overlapping seams (to prevent unwanted prying), heavy duty cam latches throughout frame, and aluminum comb to avert mail fishing in outgoing mail compartments. 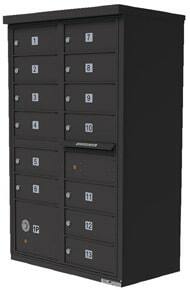 These 13 CBU cluster mailbox units come equipped with USPS approved 5-pin cylinder cam locks, 3 mailbox keys per door, and a fully integrated parcel locker with key trapping lock. Custom Silver Decals can have up to six 7/8″ characters; USPS recommends up to 3 characters. 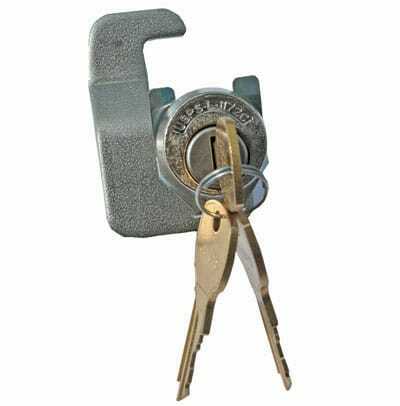 Custom engraving can have up to twelve 3/4″ characters and has black or white color fill options. 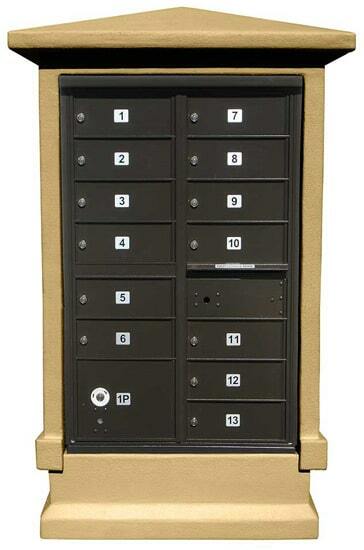 These Florence Manufacturing 13 door CBU mailboxes with Decorative Stucco Column are not returnable but can be ordered with professional mailbox installation services. Need help purchasing these 13 door CBU mailboxes? Call us or chat with a customer care rep if you have any questions.